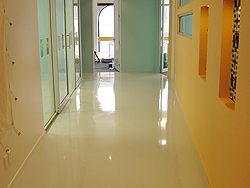 A chemical-resistant hard wearing floor coating available in smooth and three grades of non-skid finishes. It can be used in areas subjected to traffic or where non-slip characteristics are essential, and/or where protection of the substrate from aggressive agents is required. Clean room standard approved ISO 14644. 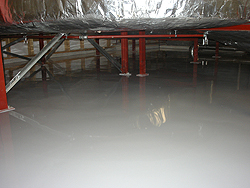 A chemical and wear resistant, self-leveling floor system for areas of hard use in industrial application. Will assist in smoothing out the uneven floor surfaces to give an even glossy finish. Can be made non-skid to varying degrees in localised areas or overall, depending on the individual requirements. Clean room standard approved ISO 14644. A chemical and wear resistant, self-leveling floor screed for areas of hard use in industrial application. Will assist in smoothing out the uneven floor surfaces to give an even glossy finish. Can be made non-skid to varying degrees in localised areas or overall, depending on individual requirements. Clean room standard approved ISO 14644.